We cover tips, tactics, strategies and all the fun around small-sided football. Our game isn’t just played inside huge stadiums by high-paid, supermodel-dating, Ferrari driving superstars. It’s played by you and I and millions of other ordinary (and some not so ordinary) people each week. Football is in our blood, it’s our frustration, our joy, our release, our sanctuary. We’ve lived and loved it most of our lives, and for the vast majority of us there’s not been a Ferrari in sight. So we may not have made the heady heights of the Premier League, but that doesn’t stop us living out our love affair with the game. Our mission is to bring you articles that are fun, thorough, and of actual practical use to the average amateur player. If we’ve done that, and we’ve improved your experience of small-sided football in any way, we’re happy. 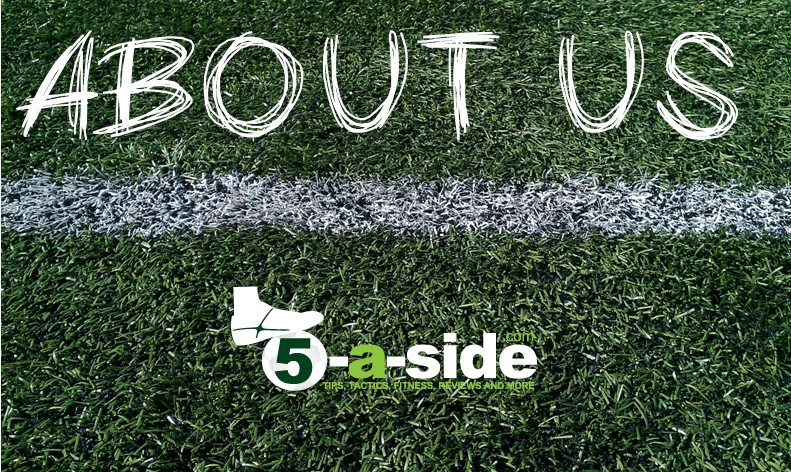 The best way to familiarise yourself with the site is by getting stuck in and reading our best stuff, which we’ve gathered together in this list of the best posts on 5-a-side.com. Over the past 10 years with the development of ever-improving facilities, 5-a-side has emerged as the game of choice for the amateur player. There are now more people playing small-sided football (mainly 5-a-side, 6-a-side and Futsal) than there are playing the 11-a-side game. A revolution has occurred and there are now literally millions of us playing this type of football, each week, worldwide. This site is aimed at you: the players who faithfully turn out every week, come rain or shine, to revel in the chance to kick a football around with your mates. Sign up now for our weekly e-mails and you’ll be able to keep up to date with the latest articles as we release them! Quite simply, 5-a-side football (make sure you’re spelling it right) is any football played with 5 people on each team. The game is very popular all around the world, played using many different rules. The game can be played on hard wooden courts, on concrete, on Astro Turf, on grass, on the beach – anywhere you like. Internationally, FIFA have sanctioned only one set of rules for competitive 5-a-side: those of Futsal. This form of 5-a-side is played popularly in many countries, but a number of other variations also exist locally all over the world. 5-a-side is increasingly becoming the game of choice for a lot of players because it offers so many benefits over and above full-sized football. If you’re one of the millions playing the game already then you might already have experienced this. If not, find out exactly why you should be hooked on it, starting with our articles: why 5-a-side is better than 11-a-side and the physical and mental benefits of 5-a-side. I’m the UK-based owner and main writer for 5-a-side.com. It’s not a full-time job for me – no, I also work a ‘regular job’, to feed my 5-a-side habit! I’m pretty much a regular 30-something guy who loves thinking, talking and playing small-sided football. I genuinely love all forms of small-sided football. It’s what I was brought up on. Over the years I reckon I must have played hundreds of games of small-sided football, mainly 5-a-side. In addition to that, I’ve got football coaching qualifications from the English FA – Level 2 coaching certificate, Level 1 Futsal – and I try to bring this experience to the site when I’m writing articles. By far and away the biggest qualification for running a blog like this is having passion and enthusiasm for your subject. Fortunately 5-a-side is something that I think you can see I’m fairly obsessed with. It has spilled over (possibly taken over) from real life and is bursting out to you through the means of the internet! Luckily, it seems that there are lots of other people out there who enjoy reading and talking about 5-a-side! My goal for this site is to keep it growing so that we can cater for (and help unite) more of the absolutely enormous global 5-a-side community. If you’re already a regular reader; if you’ve subscribed for articles or shared them with your friends; if you’ve liked the facebook page or followed the site on twitter then I thank you kindly! For anything you do to help bring the 5-a-side community together, I really appreciate it. I was lucky enough to find your site a while ago, and I just feel the need to say how absolutely bloody marvellous it is! I’m a old duffer living on the South Coast who plays every Saturday night in our local sports centre. It’s non-competitive, ish, and has a complete cross section of ages and ability. What we have in common, though, is the desire to get the very most out of every session. I just wanted to acknowledge the fact that your web site, articles and newsletters have completely changed my approach to these games. I played 11-a-side for years until age caught up with me and thought I knew as much as the next man, but your knowledge, and the really accessible way you pass it on, have really changed that. I also love the way that it’s obvious you really enjoy the game and writing about it. So, you can see how much I enjoy talking 5-a-side. If you have anything you want to discuss, anything I can help you with, even if you just want to say hi, then I’d love to hear from you – get in touch here.